Learning to accept your life as it is, discovering how to make the best choices and becoming more resilient in difficult times. 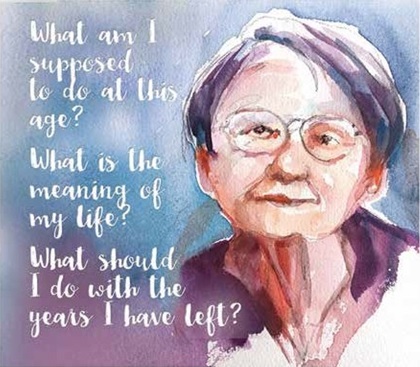 Their book, Wise Aging with Joy, Resilience and Spirit, published in 2015 by Berman House, has spawned peer groups all over the country interested in facing the next phase of their lives with self-awareness, equanimity and intentionality. Some groups are limited to a few weeks; some extend to months and even years. With funding from a variety of grants, IJS has now developed a group curriculum and has trained 250 facilitators to guide participants in text study, active listening, body awareness exercises, reflection, guided meditation and journaling. Topics range from body image and practicing forgiveness to living with loss and leaving a legacy. Rabbi Richard Address points out that both American society and the Jewish community are starting to wake up to the fact that we have a huge bubble of baby boomers comprising 76 million people. Address, 71, is the founder and director of Jewish Sacred Aging (jewishsacredaging.com), a forum for the Jewish community to discuss the implications of longevity for the aging baby boomer generation. Reports from the Social Security Administration and the Pew Research Center estimate that 10,000 people a day turn 65. According to Pew, most of the Jewish community is over 50. Because this generation is living longer in better health, the opportunities and challenges are new. Iser was 40 when she began working with Reb Zalman, so the subject was not personally relevant to her. Still, she found herself “in awe” of people in their late 60s who were excited about growing older. Now, at 66, she understands. The Spiritual Eldering Institute, which did not have a Jewish orientation, has evolved into Sage-ing International (www.sage-ing.org), and the ALEPH Sage-ing Program (www.aleph.org), cosponsored by Ruach Ha’aretz, carries on the work with a Jewish outlook anchored in prayer, liturgy, songs and teachings. 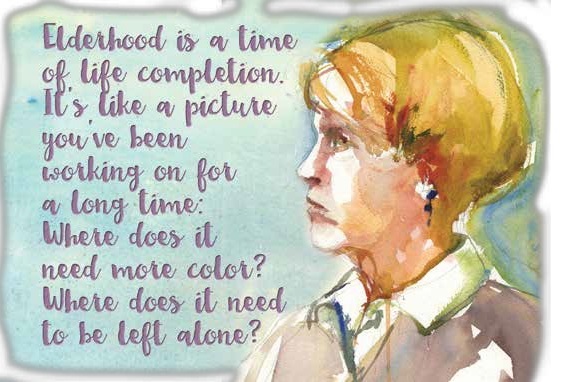 Despite the comic infusion, the stigma around growing older remains undeniable. Even finding a descriptive term that people embrace is difficult. “It’s such a large swath of life,” says Friedman. “People ask, ‘How can I at 60 be at the same stage as someone at 90? 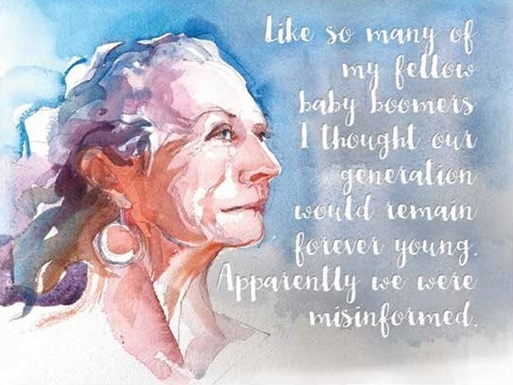 '” She, herself, doesn’t mind the term “aging.” “We are all aging from birth. It’s a process that connotes ‘becoming,’ whereas ‘old’ sounds like a permanent static thing.” She also likes “elder,” because of its sense of relationship to others. In Jewish tradition, it is used as an honorific for those connected with role, responsibility and wisdom. Ten years ago, Cowan initiated her first spirituality group, Vetaher Libenu (Purify our Hearts), which still meets monthly in her home. As the participants grew older they began focusing on the connection between spirituality and aging. Wise aging groups began at Manhattan’s Central Synagogue five years ago and are now spreading beyond the synagogue and JCC world to libraries and other institutions. Elaine Cohen, 69, a retired educator, and Rochel David, 67, a retired psychologist and yoga instructor, facilitate three groups in Teaneck, New Jersey. One is a merger of two groups that have been meeting for almost two years at Conservative synagogue Beth Shalom, and two are new six-week sessions at the Jewish Family Service of Bergen and North Hudson. The meetings include mindfulness meditation, discussion of a Jewish text on a particular theme, and conversations that encourage reflection and contemplative listening. “We look for texts that reach an emotion or have insight,” David says. The two group leaders emphasize that there is no pat formula or prescriptive wisdom, but having an accepting supportive group can open people’s eyes, develop trusting relationships and lead to moving and transformative experiences. For instance, after an exploration of forgiveness and self-forgiveness, one participant left feeling unsettled and later reached out to a friend with whom she had unfinished business. “No one told her to do that, but because of the discussion she was able to,” Cohen recalls. “It’s our age cohort so the issues resonate with us as well,” Cohen adds. Conscious dying, one of the issues addressed at an IJS retreat for facilitators this past summer, was particularly challenging, she says. “It’s being intentional about the legacy we want to leave, being explicit about your values with your children, grandchildren and friends and trying to look at the long-term issues that extend beyond our own lives.” Friedman, who has run monthly wisdom circles in individual homes for the past five years, finds the experiences to be “intimate and deep.” Modeled on the women’s rosh hodesh (new moon) group she co-founded 17 years ago, the groups provide what she calls “provisions for the journey.” They are currently women-only gatherings, though that was not her intention. “Women are more immediately drawn to intimacy, sharing and reflection,” she posits, adding that men also want to make sense of their experience and that she hopes to create mixed-gender groups focused on study. Themes have included embracing interdependence, medical treatment at the end of life, what to do with “stuff” and time, prayer and God. The synagogue, Jewish aging activists agree, can become a central force in changing attitudes toward growing older. Currently, the Jewish community has few formal programming resources learning and spirituality programming are largely focused on younger families, with identity-building targeting children and teens. Those who do care about the older population fund concrete needs like housing, health care and social services. Address of Jewish Sacred Aging works with synagogues to reestablish their connections to older members, many of whom leave, he says, because they don’t find much programming of interest to them. His programs examine issues of caregiving, wellness and mental health; consider the economics of aging and explore new rituals. When Address directed the Department of Jewish Family Concerns for the Union of Reform Judaism, he developed a project on sacred aging that has created awareness and resources for congregations. When URJ closed its program departments, he made the project his own. He highlights the need for it by pointing out that the Jewish Sacred Aging Facebook page has more than 24,000 followers. His approach is grounded in six major Torah texts that he views as a guide to healthy aging. “It’s not good for man to be alone” (Genesis 2) stresses the need for relationships. God’s command to Abraham to “Go forth” (Lech Lecha, Genesis 12) empowers us to constantly evolve, change and take risks. Jacob’s struggle with the angel (Genesis 32) and the changing of his name to Israel mirrors the possibility of recreating our identities. The Burning Bush (Exodus 3) reflects the opportunity to reinterpret and create a relationship with God. The Holiness Code (Leviticus 19) emphasizes an integrated, holistic and sacred lifestyle. And Deuteronomy’s exhortation to “choose life” emphasizes the outlook of positive aging. As an outgrowth of Address’ work, congregations have begun instituting “legacy programs” where people build their spiritual autobiographies and write ethical wills that set down what they want to leave behind in terms of moral, spiritual and ethical values. The sacred aging website also features an explosion of new rituals that tackle radically private issues: the removal of a wedding after a year of mourning, adult cohabitation, leaving a family home, being welcomed into a nursing home or signing an advanced directive or living will. “These are sheheheyanu (a blessing that gives thanks to God for enabling us to experience a special occasion) moments, that you are able to make these choices,” says Address. The most controversial, he says, is giving permission for a non-marital relationship to take place when a spouse has Alzheimers’ or dementia. “People are living these situations and want to know what their tradition says about it,” he adds. Award-winning journalist and author Rahel Musleah leads tours of Jewish India and speaks about its communities. Her website is www.explorejewishindia.com. She wrote about the artist Lynne Avadenka in our fall 2016 issue.